State University of New York researchers studied plastic pollution in the Great Lakes this summer aboard the US Brig Niagara, discovering deposits of plastic in greater concentrations than recorded anywhere else on earth. Photo from Bill Edwards. Plastic pollutants circulate in pockets of the Great Lakes at concentrations higher than any other body of water on Earth, according to a recent State University of New York study. The study is the first to look at plastic pollutants in the Great Lakes. It is part of a larger global endeavor to understand the origin and prevalence of plastic pollution in water and was conducted with the Los Angeles-based 5 Gyres Institute. “We had two samples in Lake Erie that we just kept going back and rechecking the data, because the count, the number of plastic particles in the sample, was three times greater than any sample collected anywhere in the entire world,” SUNY chemistry professor and project lead Sherri Mason said. Mason’s team of 20 students embarked this summer aboard the US Brig Niagara, the rebuilt flagship that won the Battle of Lake Erie during the War of 1812. Beginning in Lake Superior, for three weeks in July the team sailed south through Lake Huron and into Lake Erie, collecting water samples as they traveled. 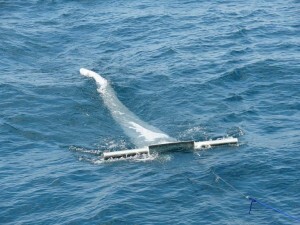 Twenty-one samples were collected with a net trailing from the vessel. The net’s mesh was a mere 333 micrometres, or 0.013 inch, wide. They found the least plastic in Lake Superior, with the concentrations increasing as they sailed south. That’s because water flows south from Lake Superior through Lake Huron and into lakes Erie and Ontario. The water carries plastics from one lake to the next, compounding the concentration each time, Mason said. That her team found plastic pollution was unsurprising to Mason or anyone involved with the project. But they were surprised by the volume of plastic, and even more by the kind of plastic they found. The net Mason and her team trailed from the Niagara to collect their samples. Photo from Bill Edwards. 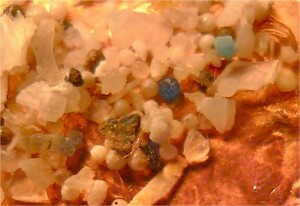 Most of what the team found was what Mason refers to as microplastics, pieces less than 5 millimeters wide. Such fragments are much smaller than those Mason’s team expected to recover. Why larger pieces were not more common baffles researchers. Mason and her colleagues think that the microplastics could be washing up on beaches, or that it may be entering the food chain if consumed by microorganisms or fish. “There’s this uncertainty right now, so one of the next things we have to do is get out on a boat and look at the food chain to see if the plastic shows up,” Mason said. If plastic gets into the food chain, it presents a serious human health threat, Mason said. According to her research and those of her colleagues, many non-plastic pollutants, known as persistent organic pollutants or POPs, latch onto plastics in the water, which could then be consumed by aquatic life with a variety of consequences. Beads of microplastic collected from Lake Erie by Mason and her team. Photo from Marcus Eriksen. “All those chemicals leach from the plastic into the fat of the fish,” Mason said. “This has both direct ways of harming the fish, such as lining their intestines and interfering with their ability to absorb nutrients from food, and indirect ones. The dangers of plastic in the aquatic ecosystem is recognized by both scientists and the plastics industry. According to the American Chemistry Council, a national trade association representing a multitude of chemistry firms, including plastic manufacturers, any human debris is potentially destructive to the lakes. Wilson added, however, that microplastics like those found by Mason could be less harmful than many fear. “This is an emerging area of research, and we’re all committed to better understanding microplastic’s effects on the marine environment,” she said. Some research indicates that persistent organic pollutants may bond so tightly to the plastic that they cannot be separated and digested by the fish. Wilson noted that the Food and Drug Administration requires health and safety inspections of commercial fish catches, and that the Environmental Protection Agency regulates drinking water and requires water treatment facilities to filter particles from the water. Much further study of plastic in the Great Lakes is necessary before concerns over it can be dismissed, Mason said. Her study plays into the larger goals of the 5 Gyres Institute, an environmental group that studies the causes and impacts of plastic pollution in the oceans, specifically in the five subtropical gyres. A gyre is a large area of rotating ocean currents in which plastics accumulate. Having studied each of the five gyres, the institute is now turning its attention inland toward the source of the pollution. Great Lakes pollution has global consequences, Eriksen said. “The gyres we study account for about 25 percent of the planet’s surface, and they draw pollution from all over the world, including the Great Lakes. They’re covered in a thin layer of plastic soup,” he said. It would be a waste of time and money to try to clean up all the plastic in the gyres, he said. Identifying and reducing that pollution at its sources upstream is the only way to reduce it. That’s why Mason and her team conducted the study this summer. 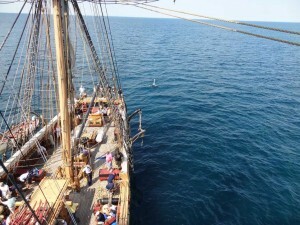 Next summer, they aim to continue their work by sailing Lake Michigan. San Francisco sea lion who had been tangled in plastic at Pier 39 was released into the wild after a successful rehabilitation at the Marine Mammal Center on Thursday. Blonde Bomber, as the sea lion was named, was first rescued with a seven-inch loop of plastic packing strip around his neck. But on Thursday, Bomber returned to the ocean as healthy as ever, stopping at the waves to give his rescuers one last nod. "It's a happy day for Blond Bomber for sure," said a rescuer. "His luck has changed." WECT TV6-WECT.com When you snuggle up on your couch in a warm, fuzzy blanket, you're probably not thinking about how much lint from that fabric could be contributing to environmental pollution. A study conducted by the University College Dublin discovered tiny microscopic particles of plastic are actually littering oceans and beaches worldwide. So, where is all of this plastic coming from? One major source is our clothing and other household textiles. Take a good look at your dryer lint trap because it's a pretty good indication of just how much plastic pollution you're contributing to our oceans. "It's shedding little bitty particles constantly, it's all over the environment," said Larry Cahoon, a professor of biology and marine biology at UNC-Wilmington. The rinse cycle that rids your clothing of dirt is also ripping off microscopic clothing fibers. In one study, a single fleece garment put through a wash cycle shed nearly 2,000 fibers. Those fibers travel from your household washing machine to our waterways which, eventually, make their way to our oceans. Scientists who study our waters find particles of clothing all the time under the microscope inside the bodies of marine life like plankton. "What you'll find is these fibers, different unnatural colors and it's just clothing fibers," Cahoon said. Usually blue and green in color, these polyester and acrylic fibers are made of plastic. "We think of plastics as inert, you know, harmless, but it isn't clear that's true," Cahoon noted. Once these microscopic particles of plastic make their way to our oceans, they become porous similar to a sponge. If you need proof, think about how easy it is for tomato sauce to stain the plastic containers in your kitchen. Scientists worry these microscopic plastic fibers are sopping up harmful chemicals like pesticides. Once these fibers are consumed by fish, plankton, mussels, or sent back into our drinking water supply, both plastics and pollutants enter the food chain and could, potentially, end up on your dinner plate. For now, there is no direct evidence proving these fibers actually harm marine or human life. "The assumption that out-of-sight, out-of-mind means no problem, is often wrong," Cahoon said. He recommends paying attention to how much lint you pull out of the filter of your own dryer. The more fuzz in the dryer usually means there's far more breaking down in the washer. Loosely-woven fleece falls apart faster. You can buy higher-grade or natural fabrics which hold together longer or try a gentle wash cycle that uses less agitation. All of which are things you might want to consider the next time you do your laundry, or go to the mall shopping for new clothes. It's quite alarming when you think about how just a small amount of lint can leave a brightly-colored polyester imprint on the planet. There's dryer lint (obvious, easy to clean) and washer lint. Nearly 2,000 polyester fibers can float away from a single fleece sweater in one wash cycle. Studies of sand samples found in each cup of sand, at least two fibers and as many as 31. All samples contained synthetic lint. Synthetic lint was common in both treated wastewater and in ocean sediments where sewage sludge was dumped. The fibers were mainly polyester and acrylic. Scientists have found microplastics able to absorb pollutants like DDT. Filter-feeding mussels can consume the particles. The worry is that the fibers will then end up on our dinner plates. There is no direct evidence that the fibers harm marine life, yet. Manufacturers are not required to test fabrics for their environmental impact, durability or plastic-shedding potential. More than 65% of plastic in the ocean is in bits that are less than a millimeter thick. Studies on artificial joints and plastic-based drug delivery devices have shown that small pieces of plastic can infiltrate joints and even the circulatory system. Experiments on muscles have shown similar effects. When cells take up plastic they seem to have trouble functioning. Research done by Mark Browne, an ecologist at University College Dublin, tested 18 shoreline samples on six continents. Concentrations of microplastics where highest in the most densely populated countries. In another of Browne's studies, researchers found a single wash cycle of a fleece garment could shed more than 1,900 fibers. Copyright 2012 America Now. All rights reserved. POINT PLEASANT BEACH, N.J. -- Autumn at the Jersey shore means the crowds have gone, the water is cooler – and things like a plastic heel from a shoe, a surgical mask and toothbrush heads can be found on the sand. Clean Ocean Action held its annual fall beach cleanups in 60 spots up and down the Jersey shore, removing thousands of items that were either left behind by beachgoers or that washed up with the tides after being discarded elsewhere. Underwear; weather-stripping materials; a baseball; diapers; a leg from a baby doll; a fishing pole; pieces of a pier; and bubble wands were among the stranger items collected by volunteers at Point Pleasant Beach. On Sandy Hook alone, volunteers picked up nearly 3,500 food and candy wrappers; 142 rubber balloons; 3,300 plastic straws and stirrers; more than 100 plastic light sticks; and nearly 600 plastic forks, knives and spoons. "Human trash is now found on every shoreline in the world and throughout the global ocean," said Cindy Zipf, the group's executive director. "Human trash not only makes beaches ugly, it maims and kills marine life. We must do more to reduce plastic pollution, and beach sweeps are one way citizens can help." The group conducts cleanups each spring and fall along the coast. Since 1985, over 90,000 volunteers have removed over 4.5 million pieces of debris from New Jersey's beaches and waterways. "The abundance of waste and floatable debris found on New Jersey's beaches is shocking," said Valerie Montecalvo, president of Bayshore Recycling Corporation. "The survival of our ocean and its precious ecosystems are vital to the existence of mankind and its future generations." Participants log each item on scorecards that are then tabulated as part of the group's efforts to document pollution and press for stronger laws protecting the coastal environment. As we continue sailing west, we have more questions than answers about our plastic quarry. We’re now more than halfway to Hawaii, with California 1,200 miles and 17 days behind us. While we’ve conducted more than 40 net deployments and counted close to 40,000 pieces of plastic in the North Pacific gyre, researchers at Sea Education Association (SEA) and elsewhere cannot say for any certainty what happens to the floating plastic. The plastic could linger in the ocean for an indeterminate number of years, but no one can say how long it takes the plastic to disappear from the surface and what happens next. In the Atlantic Ocean, particle traps have been placed deep in the water column near Bermuda, and despite the presence of floating plastic in the region, researchers have not detected plastic in the traps. To move closer toward the answers, it’s useful to look to the Atlantic Ocean, where plastic research has been conducted for more than a quarter century. A paper by SEA scientists and collaborators, “Plastic Accumulation in the North Atlantic Subtropical Gyre,” published in Science in August 2010 is insightful. Their data came from more than 6,136 surface tows that were conducted onboard SEA’s sailing research vessels from 1986-2008, from which more than 64,000 plastic pieces were handpicked and counted. One could expect that these data would show that plastics are increasing in our oceans. After all, plastic has become ubiquitous and in demand over the last couple of decades. For instance, beginning in 1950, half a million tons of plastic were created in Europe. This number has increased more than 500-fold in just 50 years, now they are producing over 260 million tons of plastic. Although the Marine Pollution (MARPOL) legislation of 1988 prevents the dumping of plastic in the ocean, plastic use is increasing and that plastic ultimately ends up somewhere, either in a landfill or in the ocean. A 2002 New Zealand report summarized that MARPOL is “widely ignored” and ships alone dump 6.5 million tons of plastic a year into the world’s oceans. The Science paper documents a five-fold increase in plastic production worldwide during the period of the Atlantic plastic collections studied. So if the surface-level plastic isn’t increasing in the oceans, is it biodegrading? According to a study “Degradation of Plastic Carrier Bags,” published recently in Marine Pollution Bulletin, only biodegradable bags breakdown quickly. Compostable polyester bags, according to this study, degraded completely after 40 weeks in the sea. The majority of plastic bags used are not compostable or biodegradeable, and are made of materials such as polyethylene which degraded by only 2% in that same amount of time. It should be noted that most biodegradable or compostable plastics are made to compost in a hot landfill rather than in a cold ocean. Added to that is the fact that degradation in the sea involves sunlight and most of these UV rays are blocked and absorbed by barnacles or other biomass growing on the plastic—slowing degradation. Eventually, these plastics are reduced to smaller pieces, such as the micro-plastic soup we’ve encountered here in the Pacific. “There’s no reason why plastic couldn’t break down to a molecular level and exist as finer and undetectable particles in the water,” says Greg Boyd, an SEA employee and researcher onboard the Robert C. Seamans (RCS). Greg’s hypothesis is a work in progress, but it could explain why plastic—at least when harvested through net tows—doesn’t appear to be increasing in our oceans. Microbes also create biofilms over plastic and this might cause the plastic to sink. At the same time, there is evidence (seen through electron microscopes as “pitting” marks on plastic) to suggest that microbes could potentially be physically degrading or even “eating” the plastic. Aboard the RCS, our experience in the gyre has shown us something different about where the plastic is found. Through every-other-day use of the MOCNESS tow (which opens nets at four different depths in the ocean to collect plastic), we’ve found that plastic is not just limited to the surface zone. Although the plastic levels are thick in windrows where currents and wind combine to create alleyways of plastic flotsam on the surface, MOCNESS harvests have shown us that the wind is also forcing plastic down to 30-foot depths. So we continue to pitch and roll through this bluest of gyres, hove to for the last two nights to slow down so that we can complete the research. We’ve ducked around several low-pressure systems and hit only minor squalls, and more than few nights the seas have forced us to brace tight in our berths and on deck. We’ll continue to harvest both surface and subsurface samples from the water in hopes of unveiling more of the mystery of plastic’s end. Plastic bags strangling sea sponges. Beer bottles colonized by sea lilies. Such images of ocean pollution aren't usually associated with the remote, icy waters of the Arctic, but snapshots of the seafloor suggest the northern region is becoming increasingly littered with plastic. Scientists regularly drag an underwater camera just above the sea bed during expeditions to HAUSGARTEN, a deep-sea Arctic observatory in the eastern Fram Strait, between Greenland and Norway's Svalbard archipelago. The photos it takes are usually analyzed for the presence of sea cucumbers, fish, shrimp and other large inhabitants, which could indicate changes in Arctic biodiversity. But the camera sometimes catches unwelcome guests: plastic bags and other trash resting on the seafloor. "The study was prompted by a gut feeling," said researcher Melanie Bergmann in a statement. "When looking through our images I got the impression that plastic bags and other litter on the seafloor were seen more frequently in photos from 2011 than in those dating back to earlier years. For this reason I decided to go systematically through all photos from 2002, 2004, 2007, 2008 and 2011." Bergmann, a biologist with the Alfred Wegener Institute for Polar and Marine Research, found waste in 1 percent of the pictures from 2002 and 2 percent in the 2011 images, marking a twofold increase over the decade. The sharpest rise in garbage occurred between 2007 and 2011, according to the study of more than 2,000 images. Two percent is a high figure for a region thought to be one of the most secluded on the planet, the researchers said. Bergmann pointed out that they recorded more garbage in their study than was observed in a deep-sea canyon not far from the industrialized Portuguese capital Lisbon. Almost 70 percent of the litter in the pictures was in contact with deep-sea organisms, the researchers said, warning that garbage can injure creatures like sea sponges and impair their ability to breathe and absorb food. Moreover, chemicals in plastic can have toxic effects and alter gas exchange on the seafloor. Plastic even poses a threat when it's no longer visible to the naked eye. Earlier studies have demonstrated how plastic that has broken down into microscopic particles can soak up pollutants such as polychlorinated biphenyls, or PCBs. When ingested by tiny ocean animals, these toxin-loaded plastic particles contaminate the food chain. On a positive note, waste could provide a good surface for some organisms to latch on to and flourish, but researchers are not sure how this would affect the deep-sea composition of species and biodiversity in the region. The scientists, whose study appears online this month in the journal Marine Pollution Bulletin, pointed to melting sea ice and increasing ship traffic in the Arctic as possible causes for the rise in plastic. "The Arctic sea ice cover normally acts as a natural barrier, preventing wind blowing waste from land out onto the sea, and blocking the path of most ships," Bergmann explained. "Ship traffic has increased enormously since the ice cover has been continuously shrinking and getting thinner. We are now seeing three times the number of private yachts and up to 36 times more fishing vessels in the waters surrounding Spitsbergen compared to pre-2007 times." PORT-AU-PRINCE, Haiti — Plastic and foam food containers. They’re everywhere in this enterprising Caribbean nation, clogging canals, cluttering streets and choking ocean wildlife. Now those pesky black plastic bags made of polyethylene and polystyrene foam cups, plates, trays and other containers that have become as ubiquitous as the vendors who peddle them in street markets are on their way out. Haiti’s government has announced a ban on importing, manufacturing and marketing them as of Oct. 1. “This is a logical decision and makes sense," Prime Minister Laurent Lamothe said. “Importing, manufacturing bio-degradable items will benefit Haiti’s short, mid- and long-term environmental interest." In Haiti the black plastic bags are the primary mode for transporting items among Haiti’s poor who shuffle back and forth to open-air street markets on an almost daily basis. They also are a key, but dangerous, ingredient in curbside cooking, helping food cook faster. The bags and containers are then dumped haphazardly into canals, turning them into rivers of debris several feet deep. Environmental groups have been pushing plastic bag bans both internationally and in the United States for quite some time. The African nation of Rwanda became the first country to ban all plastics in 2008 while Mexico City, Bangladesh and most recently Toronto are among the largest international cities that have imposed bans. Argentina also is calling for all supermarkets to eliminate non-biodegradable plastic bags by October 2014. In the United States, bans have been approved in cities and counties from Maine to Washington. Nearly 50 cities and counties in California alone embrace a celebrity-endorsed ban. In Los Angeles, the largest American city in the country to approve the ban, bags will be phased out at thousands of stores over the next year or so. Meanwhile, in Florida, a 2009 attempt by the state’s Department of Environmental Protection fell flat, thwarted by consumers. Bill Hickman, who coordinates the anti-bag campaign for The Surfrider Foundation, one of the more active organizations on the issue, said he wasn’t aware of any targeted effort in Haiti. He calls the proposal “great news." Mostly cities and urban counties have adopted the ban, which targets the thin, lightweight plastic bags commonly used at grocery stores and convenience store check-outs. But some of the worst pollution from the bags occurs in poorer undeveloped nations, said Hickman. “We see a lot of issues in the Third World," he said. “Some of the most shocking photos come from places like Indonesia and Central America. These items are very cheap and easy to litter and there is very little infrastructure to recycle them." For environmentalists, the biggest problem is that many of the billions of bags used annually commonly end up in the ocean where they and other plastic debris kill countless sea birds, sea turtles and other marine life. The thin bags, which blow away with the slightest winds, also pose problems at landfills and in most cases aren’t cost-effective for recycling. “It’s really kind of the tip of the plastic pollution iceberg," Hickman said. “Plastic does not biodegrade. It may (break down in sunlight) over time into smaller pieces, but it persists well past our lifetimes in the environment." The Haitian crackdown was first announced last month in a presidential decree issued by President Michel Martelly. After initial confusion and public protests because it was assumed that plastic bags used for potable water were also being targeted — for now they are exempt — the crackdown appears to be winning public support. For weeks, the government has been running TV spots informing the general public about the ban. “If they tell us not to sell them, we won’t," said Christine Resile, 39, a mother of three who began peddling plastic bags last year after losing her $50-a-month housekeeping job in the hills of Port-au-Prince. “We sell them because we don’t have any alternatives; not because we love selling them." Marguerite Etienne, who sells food on a congested curbside in downtown Port-au-Prince, said she’s prepared to work with the ban. “The clients will just have to come with their plates and bowls as they did before we started using the containers," she said, frying plantains and pork on a charcoal stove. To-go foam containers were stacked nearby. “These things litter the country. Haiti wasn’t always this dirty," Etienne said. But getting Haitians to adjust to the changes may be easier said than done. The imported containers, which come mainly from the neighboring Dominican Republic, have become an integral part of daily life. For instance, a day after Tropical Storm Isaac flooded the country last month, Martelly posted photos on his Facebook page showing his wife Sophia Martelly distributing hot meals to children on foam plates. Environmental activists in Haiti say while they commend the government for being environmentally proactive, they do wonder how Haiti — a country that already struggles to control its porous borders and collect taxes — will police the ban. “I would like to see it go through, but I would also like to see them have a contingency plan if it doesn’t," said Sam Bloch of Haiti Communitere, a nongovernmental organization in Port-au-Prince that promotes environmentally friendly projects among Haitians. “There is still plenty of trash in Haiti that is waiting to go into the ocean." A groundbreaking marine voyage by scientific vessel Tara reveals the disturbing state of the world's plastic-filled oceans. The Tara just completed a 70,000-mile journey over two and a half years, going from the Mediterranean, the Atlantic, the Indian Ocean, the Pacific and the Antarctic with the goal of studying "planktonic and coral ecosystems in the perspective of climate changes," noting that "Studying plankton is like taking the pulse of our planet." The researchers recorded 1.5 million species of marine micro-organisms, more than previously were thought to have existed. But what the research team also found in the the Southern Ocean and Antarctica was the frightening, planetary reach of plastic in the world's waters. "We had always assumed that this was a pristine environment, very little touched by human beings," said Chris Bowler, scientific co-ordinator of Tara Oceans, according to the Guardian. "The fact that we found these plastics is a sign that the reach of human beings is truly planetary in scale." "It's too late to do much about what's already out there at this stage, as this stuff is going to hang around for thousands of years," said Bowler. In 1988, National Oceanic and Atmospheric Administration researchers measuring pollution in the Sea of Japan predicted that plastic contamination would show up in much greater quantities in the Pacific Ocean. Researchers had already confirmed the presence of a new, giant soup of plastics, which the media eventually dubbed the Great Pacific Garbage Patch. In fact, with the exception of larger plastic that washes up on beaches, most of the plastic floating near the ocean surface is mere millimeters in size, undetectable by satellite, or even human eyes, unless the sea is flat calm. The plastic is suspended at surface level within the collision of currents that creates the 7 million square mile gyre, spinning clockwise like the eye of a hurricane in mid Pacific Ocean. Since little science has been performed, no one has yet accurately quantified the size of this soup—twice the size of the U.S., says the media; twice the size of Hawaii say some researchers. Nor do we know exactly what’s living on it, or how widely it has damaged the natural ocean ecosystem. According to Greenpeace, 267 species around the world are adversely affected by plastic marine debris that largely comes from land and gets trapped within one of five major oceanic gyres. On October 3, a Sea Education Association (SEA) tall ship with a state of the art laboratory and 38 researchers (including graduate students, educators, an environmental policy analyst, medical professionals, writers, scientists, and professional mariners), will sail due west from San Diego, into the heart of the North Pacific Gyre. The 134-foot Robert C. Seamans, may also encounter debris from the 2011 Japan tsunami. As the journalist on board, I will be sending back regular dispatches and photographs, detailing events as well as news about our findings. These dispatches will supplement videos sent by the ship filmmakers, and more detailed science, relayed by staff scientists on board, who will be studying the organisms—from microbial life to the larger barnacles and crabs—that live in the floating plastic soup. Through this initial web outreach, with weekly dispatches at National Geographic News Watch and daily dispatches at http://www.sea.edu/plastics/, we’ll share an intimate look at plastic pollution, as well as our 2,500-mile, six-week adventure to Hawaii.